Now arriving...the BOSL Fashion Week releases!!! *VoguE* releases for BOSL Fashion Week carried a theme of "Asian Invasion" with each outfit being influenced by different Asian countries. The collection was for sale for two days following the unveiling and has since been sitting under wraps. Starting Saturday, September 29, the fashions will begin to be released for general sale, ONLY at *VoguE*. Our first release is.....AI AO DAI. The Vietnamese influence is apparent, as the Ao Dai is an traditional Vietnamese outfit for women, consisting of a long tunic worn over pantaloons. Not quite so traditional looking, the version at *VoguE* is definitely a fashion statement not to be missed! Unique, original, *VoguE*. Now available in SIX colors. 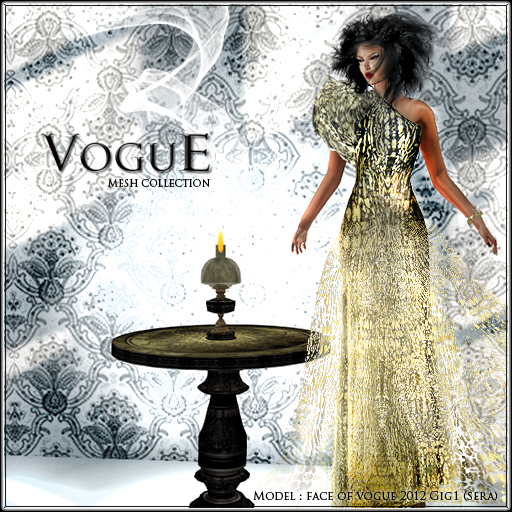 Check out the latest release in the Mesh Collection from *VoguE*. Adrian is a wonderfully feminine, one-shouldered creation with a light and lacy overskirt that floats as you stroll. Available only at *VoguE* Mainstore. BOSL Fashion Week kicked off with Vogue.... 12 New Asian Collections, among them 4 are special editions (Eliza Gown, Adrina Gown, Isabel Gown and Abagail Gown).Only available at the store for 2 days (Sep 15 & 16). Isabel, the latest release from *VoguE* is sheer elegance, sequins and satin, with a surprise of fur on the shoulders. 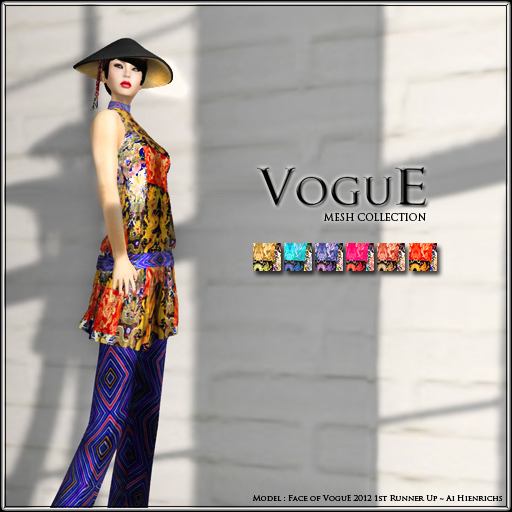 Beautiful rich colors, available Saturday, September 15 only at *VoguE* Mainstore. Who doesn't love denim? Created especially for our group members as a thank you for your support, this casual mesh denim dress is available for a limited time.....only at *VoguE* Mainstore. The latest addition to the *VoguE* Mesh Collection is Belinda, a FUN top for on the go. Available in six colors/patterns. Coordinating fabric flows from the bodice with a matching band around the bottom, ready to be paired with pants, capris or a simple skirt for a trip to town! Available only at *VoguE* Mainstore.